Carl Pridonoff from ReadySetz is this week’s guest on The Life of Dad After Show. Carl Pridonoff stops by the Life of Dad studio to talk with host, Art Eddy about his invention called ReadySetz. Carl opens up about how he came up with the idea, how his children loved playing with the play sets and what people have been saying about his invention. Carl also chats with Art about fatherhood and how he feels that kids need to play with toys that stimulate their imagination. ReadySetz was born in a playroom. As a parent, Carl loved watching his children innovate: making pots and pans into drums, using vacuum extensions as robot arms, turning pom-poms into clown wigs, etc. Still, he was worried about the mesmerizing effects of video games and tablets on his kids. He wanted his kids to exercise their own imaginations, rather than rely on someone else’s. Carl decided to try to make a play environment that was so big, so colorful, and so engaging that it would draw his kids away from their screens and give them a place to create their own stories. There were some obstacles to overcome. He wanted the toy to be big, but he didn’t want another clunky plastic toy taking up space in their rooms. It also had to be stable, but light enough for the kids to handle. So he started looking into light materials that could be configured to make the set strong, but still easy to fold and unfold for play and storage. He made the first two sets – a palace and an urban scene – for his kids. They loved them. And their friends loved them, and their friends’ parents loved them, and their teachers loved them. When he saw that the sets survived all this play, he knew he had found a way to make an inexpensive, sturdy, fully assembled toy out of 100% recyclable materials. With the help of many gifted artists and designers, they were able to make those early designs even better and are developing a full line of other cool sets and accessories. In everything they design, we are dedicated to creating play environments that encourage imagination, innovation, and unstructured play – and are fun! 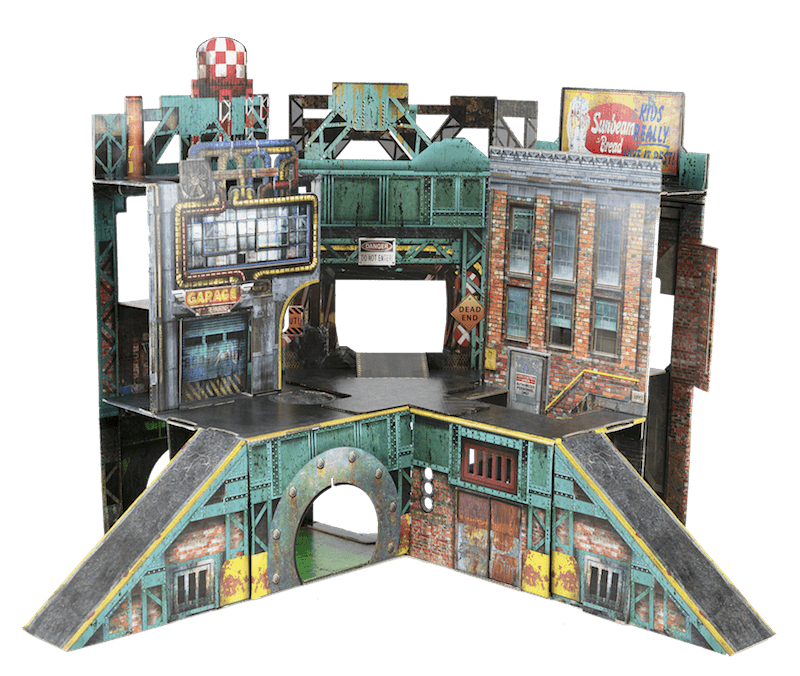 When they see the excitement on the faces of every kid who plays with the ReadySetz Urban Playset, they know they did it right. They hope you like ReadySetz and can’t wait for your children’s stories unfold! For more information go to the ReadySetz website.